North Carolina Bar Association. Nor is he a member of the N.C. Bar Center staff. 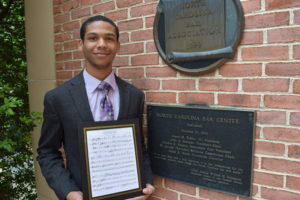 Ramsey is a senior in high school – for a few more days – and a member of the Green Hope High School Chamber Orchestra, which annually performs at Law Day. In advance of this year’s performance, he composed special music under the title of Nos Lege Unimur. When summoning the confidence to impress a judge or woo a jury, young attorney Lex-Jordan Ibegbu relies on his years as a rapper growing up in Southeast Raleigh, where he spent much of his time writing rhymes and speaking his truth to crowds big and small. A lifelong North Carolinian, Ibegbu, 27, attended Cary Academy and UNC-Chapel Hill before he headed south for a few years to earn his law degree at the University Of Miami School of Law. He returned home to Southeast Raleigh to begin his practice a year and a half ago, focusing on myriad areas including criminal defense, traffic court, business law, family law, entertainment, sports and government. Growing up in Southeast Raleigh shaped him, Ibegbu says. Usually the comment is quickly met with a knowing nod. Everyone seems to know that their reputation is important. 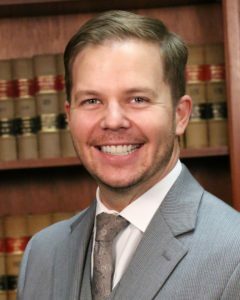 However, having witnessed many lawyers of all ages impair their professional reputations online, I have begun to realize that many of us fail to recognize some aspects of maintaining our online reputations, and I have begun to be much more specific in my advice to younger lawyers. Most demographic experts define the “millennial” generation as those born in or after 1981. The Young Lawyers Division of the NCBA comprises law students, lawyers 36 years old or younger, and lawyers of any age in their first three years of practice. This means that the Young Lawyers Division is now almost entirely composed of millennials. How are millennials supposed to collaborate in the workplace with their older colleagues who presumably are so fundamentally different? At the 2016 NCBA Mentoring Conference earlier this year, the Young Lawyers Division and the Senior Lawyers Division came together to explore this question. The Young Lawyers Division recently held its 62nd Annual Meeting in connection with the NCBA Annual Meeting in Charlotte. As the ceremonial gavel was passed across the room from our former YLD chairs, including past NCBA presidents, our current president, and our president-elect, I thought about how the YLD has truly been a training ground for leaders of our profession and our state. I then looked around the room at the remarkable young lawyers present. What an honor it is to serve alongside such an incredible group of people. The young lawyers who make up the YLD’s leadership team truly represent the best of our profession. They are smart, hardworking, selfless people who give their precious time and abundant talents, and together they are leading our more than 6,400 YLD members to achieve some remarkable things.